Head back to school this year in style with exclusive deals on the Mercedes-Benz Vito Tourer from Al Haddad Motors. Get the Mercedes-Benz Vito Tourer at a starting price of BD 16,995 with an additional education financial contribution of BD 1000 cash back to get you ready for the upcoming school year exclusively with Al Haddad Motors. Leasing options are also available on Mercedes-Benz Vito Tourer at a starting rate of BD 349 per month. 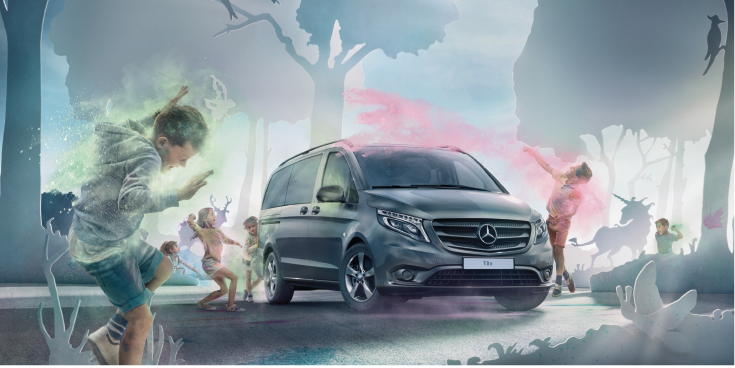 The Mercedes-Benz Vito Tourer is the ideal family vehicle that is equipped with high-rated safety, comfort and entertainment features that turn long and tedious rides into enjoyable and entertaining adventures. The Mercedes-Benz Vito Tourer is equipped with the Driving Assistance Package, a further collection of safety technologies that enhances the van’s standard safety features as well as help avoiding collision, to ensure optimum safety. The driving assistance package includes Active Blind Spot Assist, Active Lane Keeping Assist, Cross-Traffic Assist, as well as PRE-SAFE. Dynamic design and functionalitymeet in the Mercedes-Benz Vito Tourer. It features a remarkable exterior with powerful-looking radiator grille and a dynamic arrow shaped bonnet. The Mercedes-Benz Vito Tourer is equipped with LED Intelligent Light System; a technology that consists of LED indicators resembling a torch, LED daytime running lamps, as well as a lower level comprising LED low-beam headlamps and main beam with cornering light function. The interior of the Mercedes-Benz Vito Tourer is also very impressive. It is equipped with comfortable driver and passenger seats and multiple rear seat configurations that can be easily altered to meet your requirements. Furthermore, the Mercedes-Benz Vito Tourer is very spacious with ample luggage space and legroom for a very comfortable and relaxing journey. Test drive the Mercedes-Benz Vito Tourer today by calling the Al Haddad Motors Showroom on 17785454 or by visiting the Mercedes-Benz website on: www.bahrain.mercedesbenzme.com.